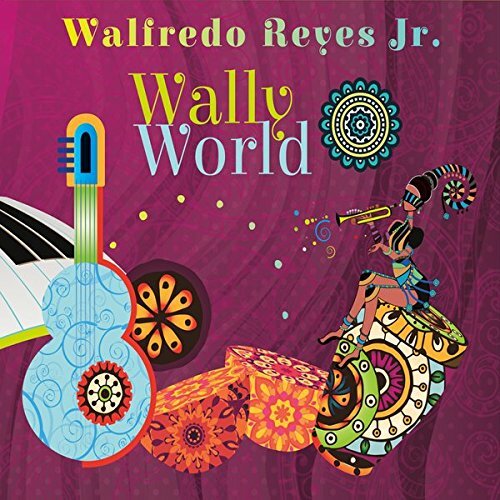 World-class drummer and percussionist Walfredo Reyes Jr. has a new CD out: WallyWorld. I had a look and a listen to his home made musical stew with some exotic flavors. “We don’t do soundcheck. Actually we don’t see and touch our instruments before we enter the stage in the evening.” This statement is from Walfredo Reyes Jr.. I couldn’t believe my ears, when I heard him say this two years ago. Seems like that’s the advantage of having amazing roadies and audio engineers with you on tour. 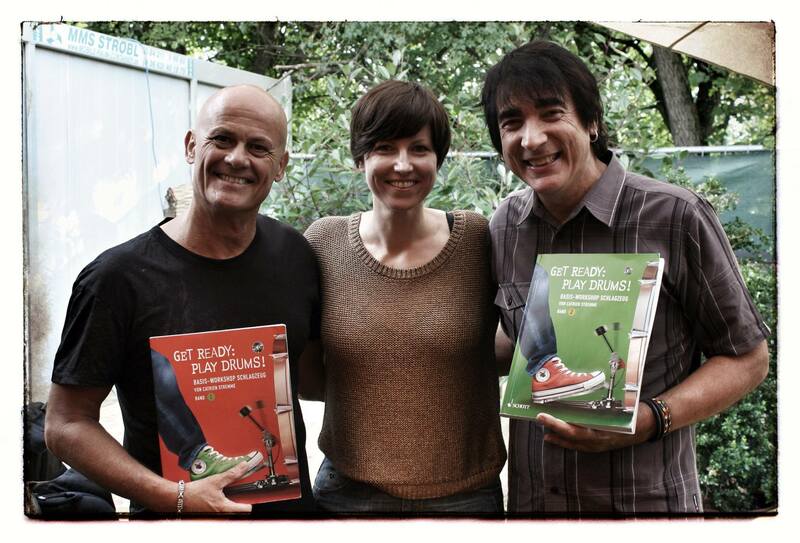 Great framework: Tris Imboden, me and Walfredo Reyes Jr. So that was the first time I met with Wally: in 2014, when he was touring with Chicago. Very spontaneously he agreed to do a double interview together with his drummer pal Tris Imboden. It was one of the nicest, most relaxed and most fun interviews I’ve ever done. 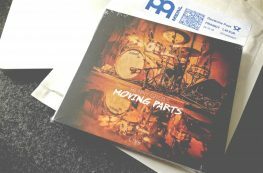 In the end I even received a gift from Wally: his instructional DVD Global Beats For Drumset & Percussion. Although the new Chicago album Now wasn’t too catchy in my ears, I stayed for the concert in the evening. And was I glad I did – what a powerful band performance. 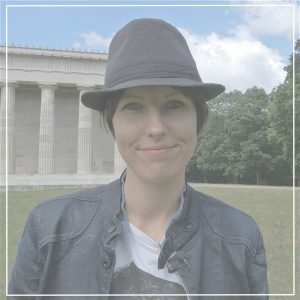 I couldn’t believe how many songs I knew, how many hits Chicago has. Outstanding musicianship, fantastic entertainment and an infectious energy. No wonder the band is traveling the world almost non-stop. When we met again in the beginning of this year, Wally suggested a very unique and cool place: a warehouse, of course not just any warehouse, but the home of the Los Angeles Percussion Rentals. Are you curious what a huge room full of drums and percussion instruments looks like? Well, I had my camera and some microphones with me, have a look at the post and video. While Wally enjoys himself in this toy land, it becomes obvious what an outstanding musician he is – not only on percussion, but also on drums. WallyWorld is a long story, if you take a look behind the scenes. It all started with the recording of Wally’s Global Beats’ DVD in 2005. The same tracks became the scaffolding for this new CD. While life, death and gigs intervened, finishing the record took ten years longer than expected. However, great things can happen sooner, later or also meanwhile – especially for artists, who collect more and new ideas along the way. Furthermore a real good stew needs to sit on the stove for a while. And that’s what WallyWorld is: a musical stew with many exotic flavors. What Wally did is this: he co-wrote nine tunes, each in a different musical style, and drummed together musicians he enjoys playing with. 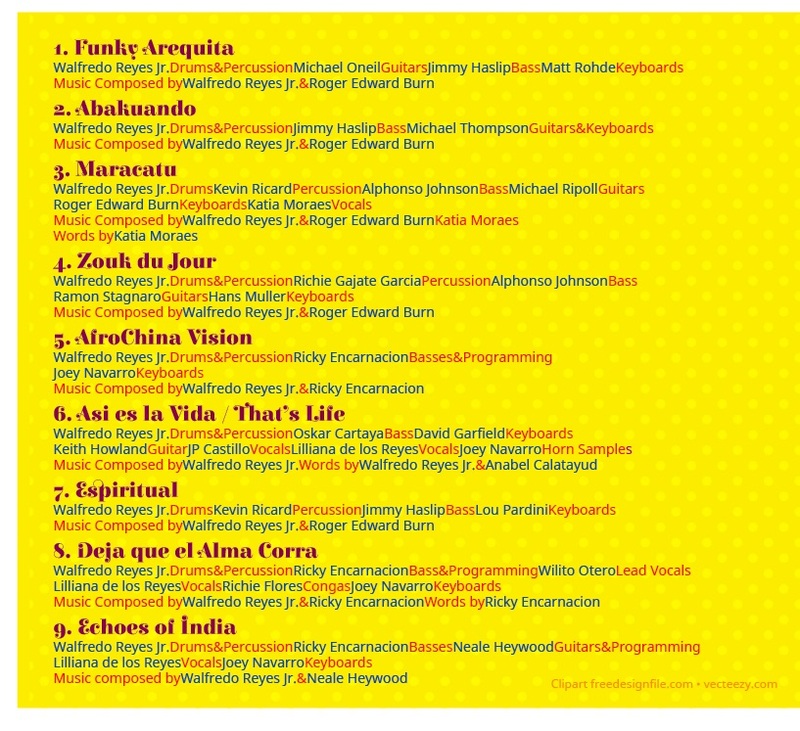 The list is impressive and includes Kevin Ricard, Richie “Gajate” Garcia and Richard Flores on percussion, Michael Oneil, Michael Thompson, Michael Nomad Ripoll, Neale Heywood and Keith Howland on guitars, Ricky Encarnación, Alphonso Johnson and Oskar Cartaya on bass, Joey Navarro, David Garfield, Hans Muller, Matt Rohde and Lou Pardini on keyboards, Wilito Otero, Katia Moraes, JP Castillo and Wally’s daughter Lilliana de los Reyes on vocals. Time to find out who Walfredo Reyes Jr. is and what he captured in some studios with all of these pro musicians. 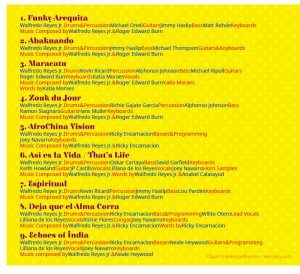 Check out WallyWorld: Walfredo Reyes Jr. – WallyWorld (CD | 2016) Enjoy!